When you think of a stone castle fort with gun ports and swiveling cannon bastions, images of European castle fortresses probably come to mind. A stone fortification that repels invaders with projections for pouring hot liquids and/or rocks down on attackers seems in place within medieval Europe, but yet this castle fortress lies not there, but on the Ottawa River. 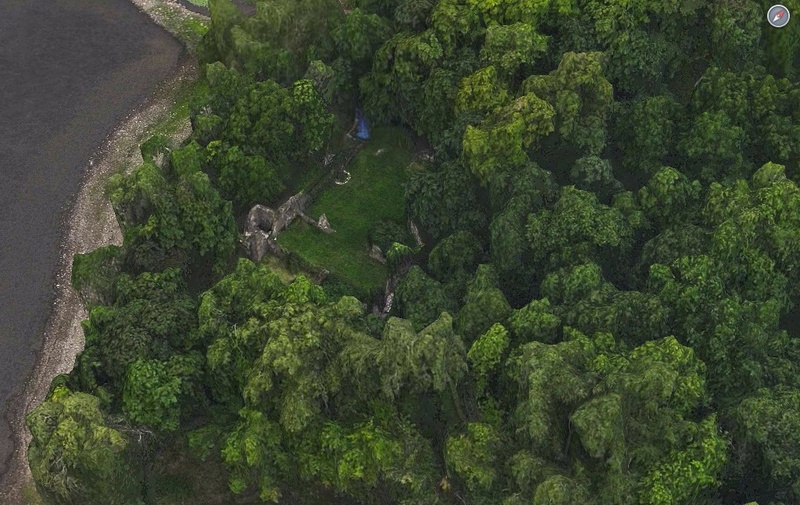 Hidden amidst trees in someone’s backyard, there lies the ruins of a 17th century stone fortress. Approximately 160km east of Ottawa hidden from view on the banks of the Ottawa River sit the remains of Fort Senneville, a 17th century stone castle-fort built to protect French settlers. The fortress ruins sit in the backyard of a residence on Senneville Road, designated a National Historic Site, but out of view from the general public. 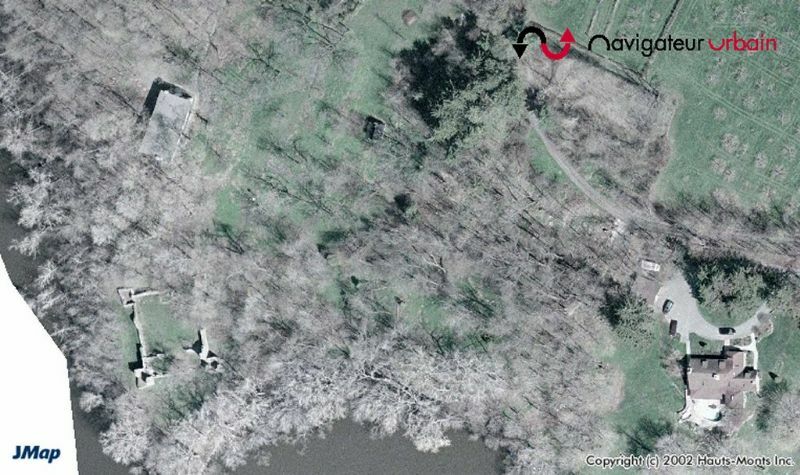 The fort can however be seen with the use of aerial images such as Google Maps and Bing Maps where we can further study this fascinating piece of history under the trees. 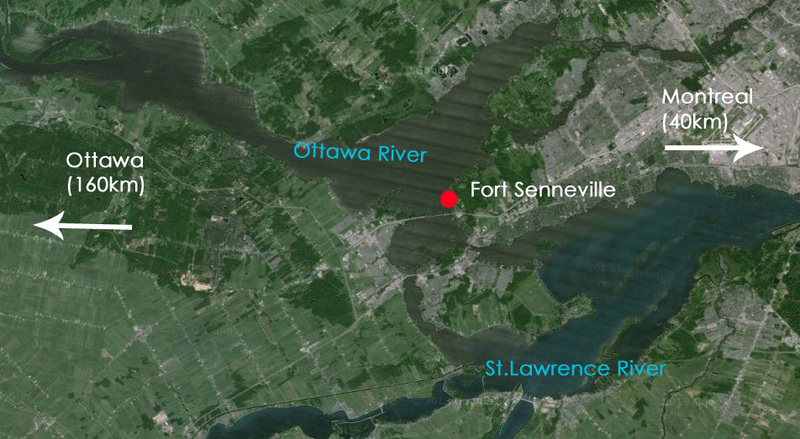 Location of the fort in relation to Ottawa. 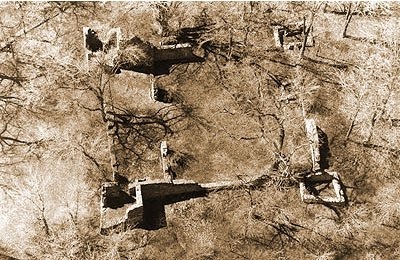 Closer aerial view showing the location of the fort. 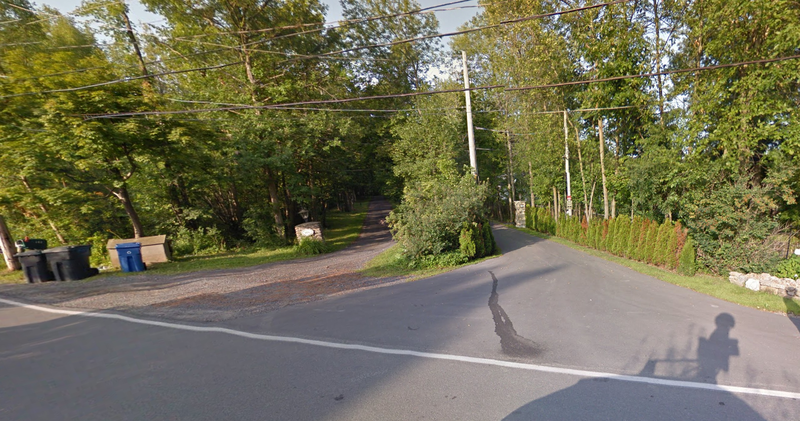 Google streetview showing the entrance to the private residence where the fortress sits in their backyard. The fort is the westernmost stone fortification built by the French on the Ottawa River when they constructed a protective string of 30 outlying forts to repel the Iroquois threat to the expansion of French settlements. 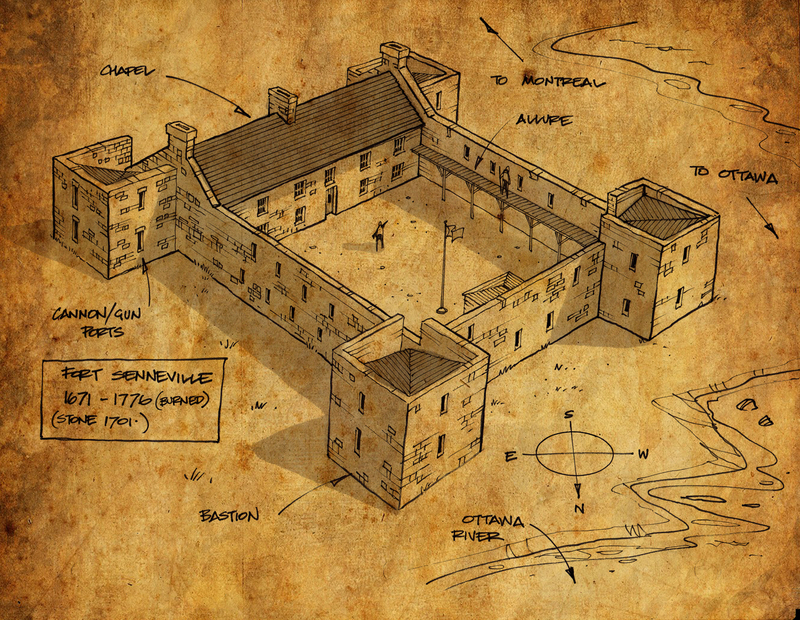 Originally the fort was constructed of wood in 1671 and was attacked by the Iroquois in 1687, a year after a fortified stone mill was built on the site that also served as a watchtower overlooking the Ottawa River. The initial attack was repulsed, but the Iroquois returned in greater force in 1691 when they successfully attacked and burned the wooden fort to the ground. 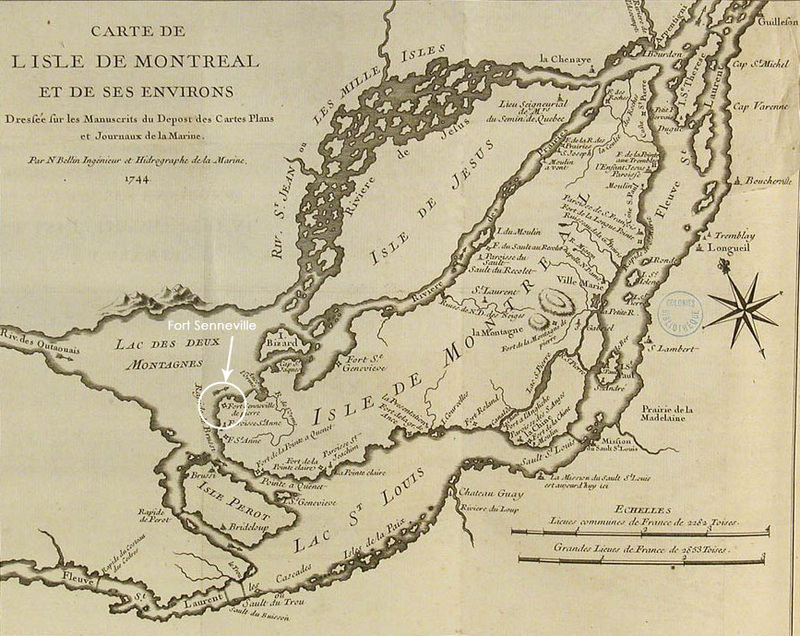 A map from 1744 showing the location of Fort Senneville. 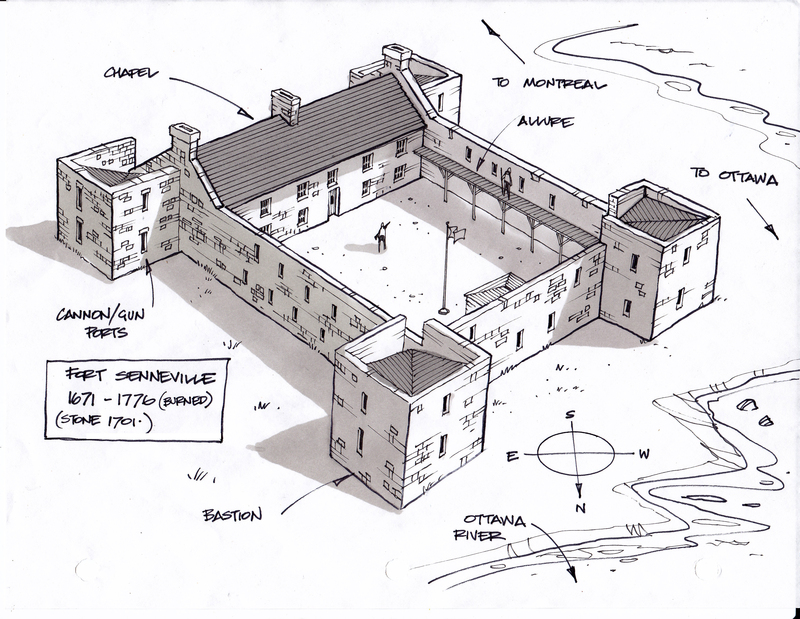 Governor-General Frontenac then ordered the construction of a stronger, more substantial fort, and in 1692 Fort Senneville was constructed using thick stone walls and corner tower bastions, cannon ports, musket ports, and extensive swivel wall guns. 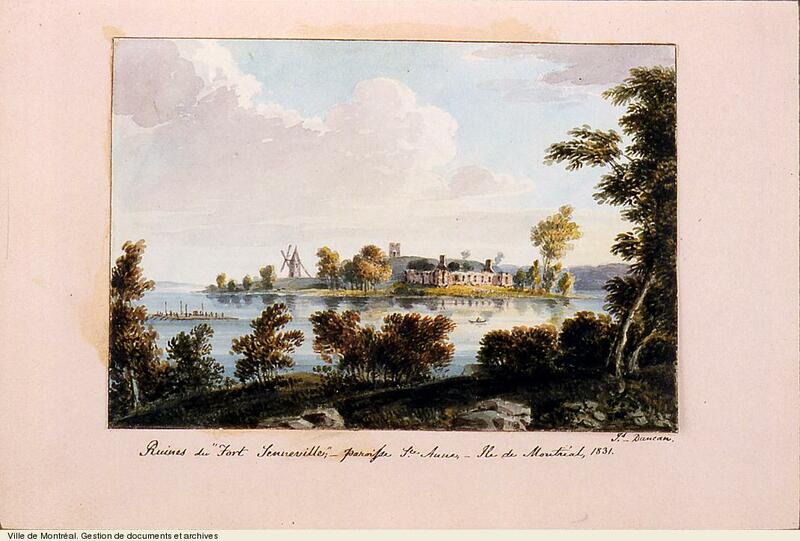 Fort Senneville on the Ottawa River was the “most substantial castle-like fort” near Montreal. 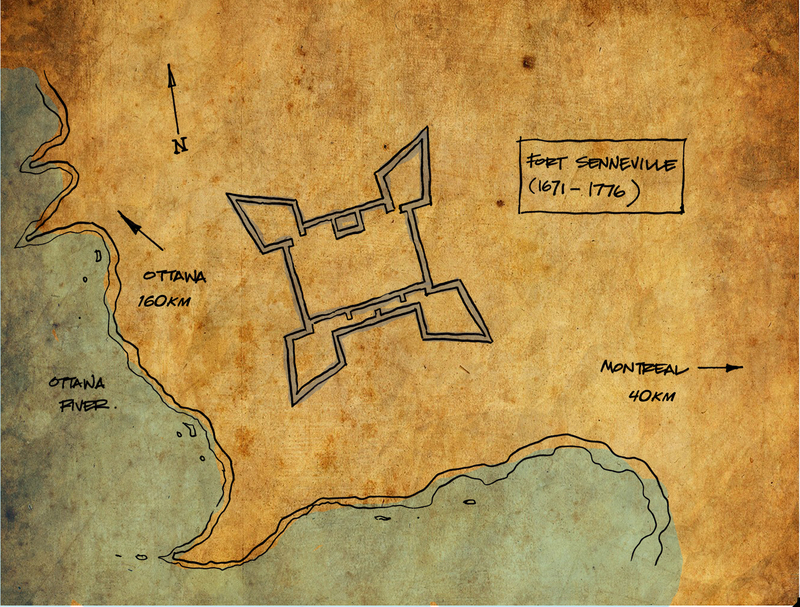 Top view sketch of the fort footprint near the Ottawa River. This new fortress was never attacked again. It remained a stronghold on the easternmost end of the Ottawa River near where it meets the St. Lawrence River, a strategic location for shipping and fur trading operations. This imposing castle-like French fortress was ceded to the British in 1763 after the fall of New France and it remained an unused outpost. 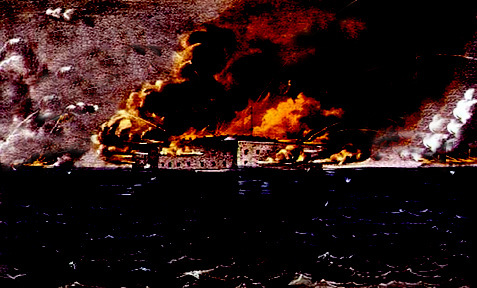 However, in 1776 during the American Revolutionary War, the fort was doomed. 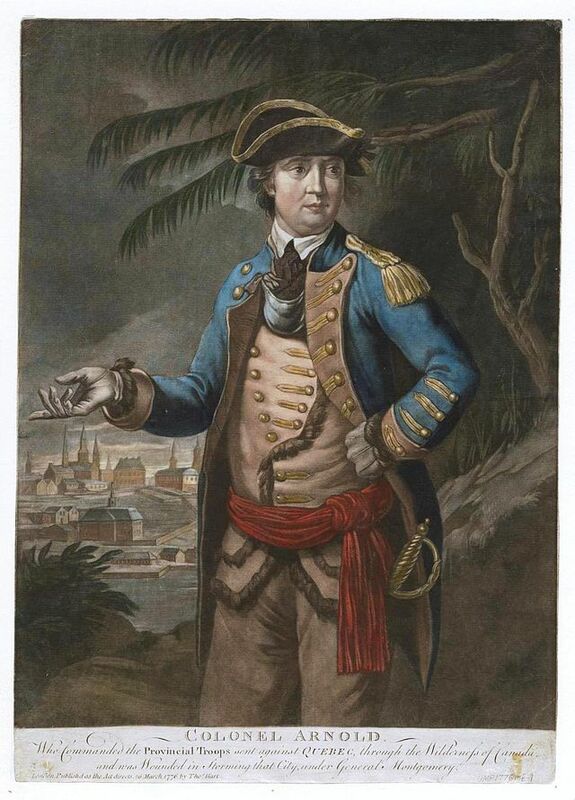 Benedict Arnold, who destroyed the fort in 1776. Benedict Arnold leading his Continental Army troops in military maneuvers during the Battle Of The Cedars took over the fort and burned it to the ground as they retreated back to the United States. Arnold successfully destroyed the fort before he switched sides and joined the British around 1780. Benedict Arnold took over, then later burned the fort as he retreated to the USA during the American Revolutionary War in 1776. The ruined Fort Senneville was purchased in 1865 as a summer residence by the former prime minister of Canada and mayor of Montreal, John Abbott. The property then changed hands again in 1898 to Edward Clouston, the General Manager of the Bank Of Montreal. A photograph of the fort exposing the ruins when the foliage has cleared during the autumn season. A Google Map image showing what remains of the 17th century fortress. Artwork from 1831 showing the ruins of the fort, which look to be in good condition at the time. Since then the property has been privately owned and the hidden stone fortress remains cloaked under trees on the shores of the Ottawa River. It was designated in 2003 by Quebec for historical significance by classifying it as a “site historique” . Archaeological research and repairs funded by the Ministry of Culture and Communications has helped preserve what remains, and in 2009 it became a National Historic Site. 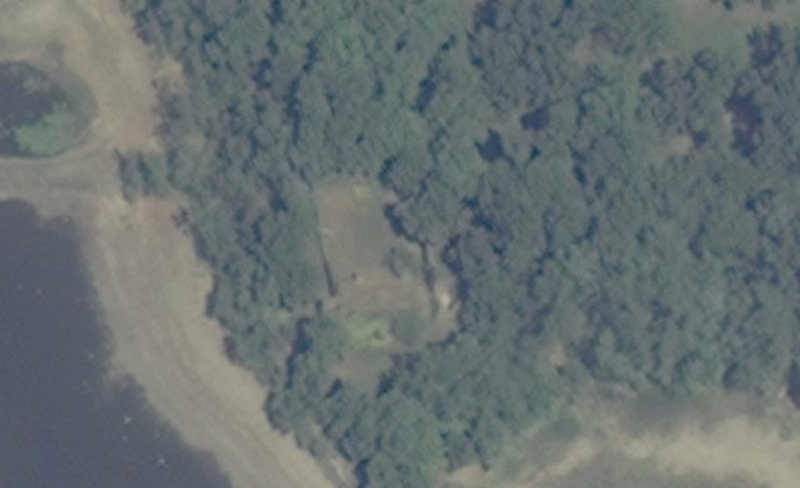 This aerial image shows the modern residences nearby with the fort in their backyard. 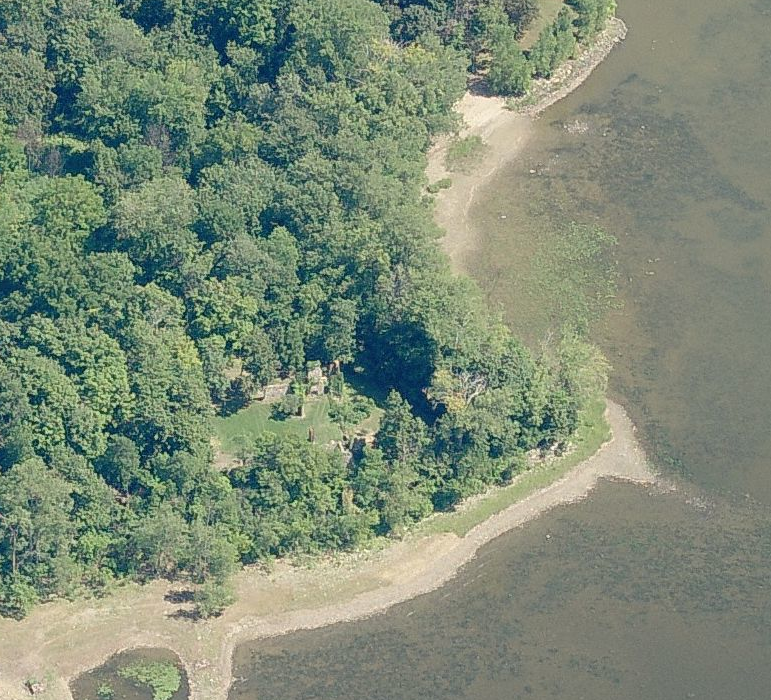 Bing Map image showing the ruins of the fort near the Ottawa River. The ruins of the fort continue to be under private ownership and public access is not allowed. 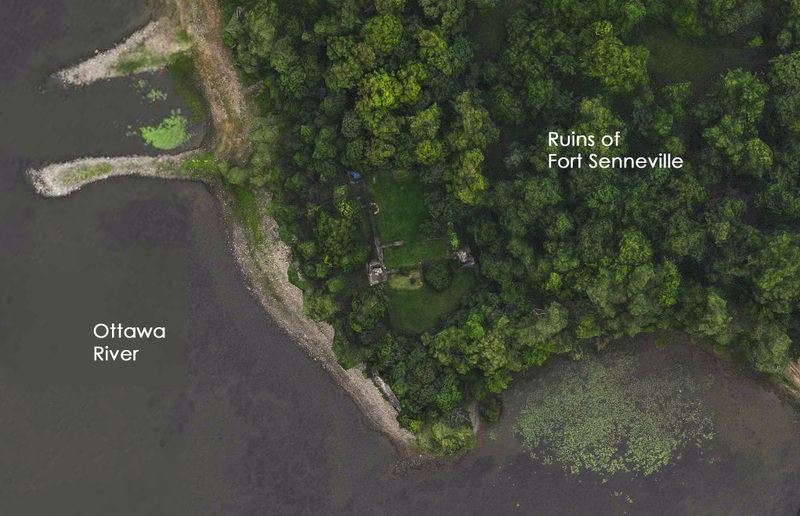 It is interesting to think that what remains of the largest stone castle-like fortress on the Ottawa River from the 17th century remains hidden in someone’s backyard, out of sight for those of us that aren’t invited to their backyard barbecue. The destruction of our beloved and popular landmark will occur over the course of the next few weeks, but before that happens, let’s take a closer look at our famous rocket before it is sadly gone forever. Our rocket is an Atlas 5A (Serial #56-6742) and it is the only surviving Atlas in the original A-series configuration. The first Atlas flown was the Atlas A in 1957–1958. 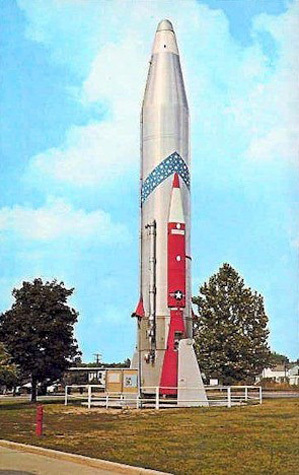 Our rocket was built in 1956 used as a test and research article, later displayed throughout the 1960s at the former location of the Air Force Museum, at Wright-Patterson AFB, Ohio. Our Rocket as it appeared on display in the United States before arriving in Ottawa. The Atlas-class rocket was used to put Lt. Col. John Glenn in space becoming the first American to orbit the Earth in 1962 and was also the first intercontinental ballistic missile. (ICBM) . Nuclear ICBM launch silos were built across the US during the cold war to facilitate nuclear armed Atlas rockets. The Atlas was retired from service in 1965. An Atlas rocket with the Mercury capsule attached circa 1963. One such missile silo exists just south east of Ottawa in Upper New York state, Here is a Google pic of the abandoned Atlas ICBM silo located just a two hour drive from Ottawa. 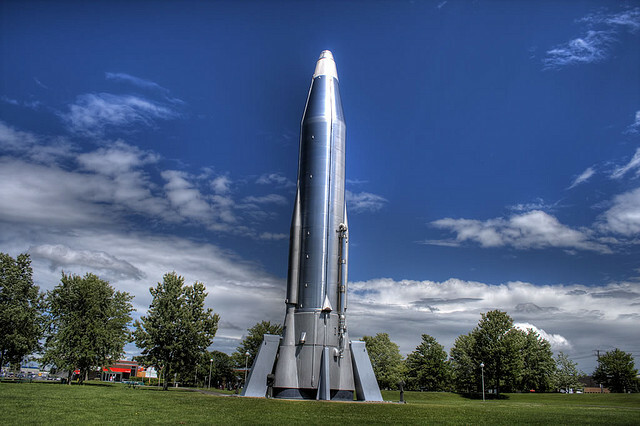 The rocket was loaned to the museum in Ottawa by the USAF in 1973 when it was installed on the front lawn of the museum..
Pressure in the tanks provides the structural rigidity and an Atlas rocket would collapse under its own weight if not kept pressurized with 5 psi of nitrogen in the tank even when not fuelled. The compound WD-40 was invented in 1953 by Dr. Norm Larsen, founder of the Rocket Chemical Company and first used by Convair to protect the outer skin of the rocket, more importantly, the paper-thin balloon tanks of the Atlas missile from rust and corrosion. These stainless steel fuel tanks were so thin that, when empty, they had to be kept inflated with the nitrogen gas to prevent their collapse. A sad end to a rocket that launched the imaginations of thousands of kids over the last four decades. You’d think we’d be able to find an alternative way save this valuable piece of world history. Does anyone have the Smithsonian’s number? After recently contacting the Smithsonian Air and Space Museum about the doomed rocket, they put me in touch with Discovery Park Museum in Tennessee. There is a slim chance the rocket may have a new home and avoid being cut up. A Smiths Falls landmark for over a hundred years, the giant iron bridge on the outskirts of town that once spanned across the Rideau Canal sits like a massive sentinel, forever poised at a 45 degree angle. Built by the Canadian Northern Railway over the course of the year 1912-13, the bridge was part of the Toronto to Ottawa connection of the CNR. Designed in Chicago and built by the Dominion Bridge Company, this massive iron bridge showcased a new style of bridge engineering fairly new to North America called the bascule bridge. 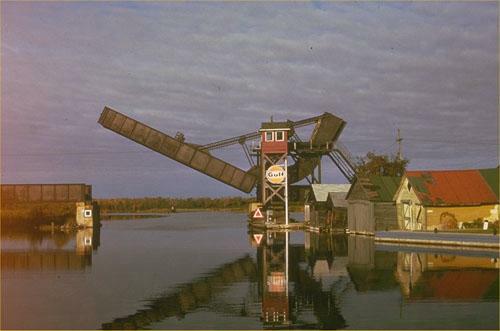 Called the Schrezer Rolling Lift Bascule bridge, after the Chicago company who designed it, these bridges were designed for areas where a high rail bridge or swing bridge could not be implemented. 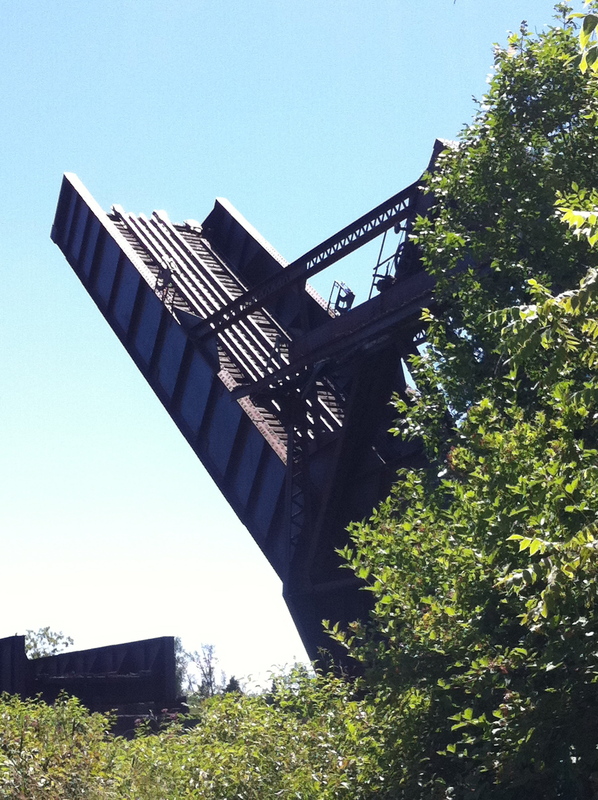 “Bascule” is French for “see-saw”, the principle used in its design and operation. Using a massive concrete counterweight perfectly balanced, the bridge lifted up with relative ease by either manual or electric operation. The bridge first began operating by manual fashion, but in 1914 a DC electric motor was installed to raise the bridge, but in 1915, the town of Smiths Falls switched to AC electric current, making the bridge motor useless. It went back to being manually operated until 1978. The CNR line later closed, and the bridge was put in a permanent “up position” which is how it remains to this day. The Iron Giant in Smiths Falls. The bridge is the oldest surviving structure of its type in Canada and is in the care of the City Of Smiths Falls who claimed ownership of the bridge in the mid-1980s. It can easily be visited by foot and every year hundreds of boats pass beneath its ironwork as they travel under this looming iron giant on the Rideau Canal system. It was designated a National Historic Site in 1983. 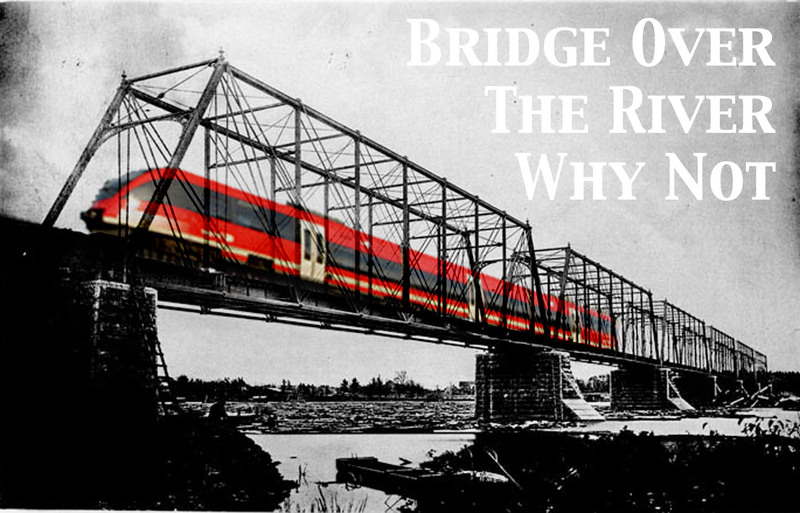 Concept of the O-train crossing the Ottawa River on the dormant Prince Of Wales bridge. 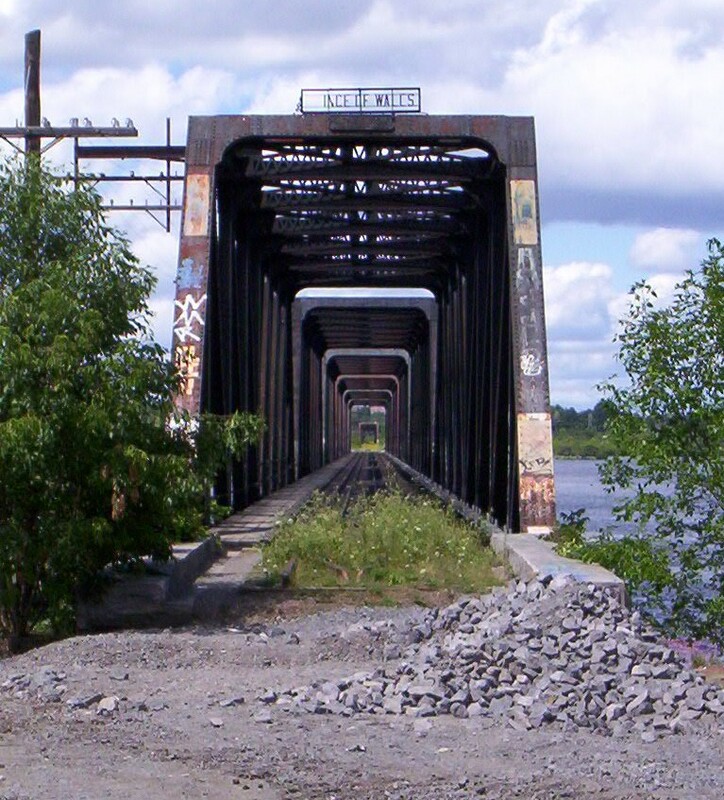 The oldest railway bridge in Ottawa is being considered for a pedestrian/bike path. Finally something is being done to make use of our Prince Of Wales bridge, an Ottawa River landmark built in 1880 that was abandoned in 2001. Since then it has simply been a magnet for daredevils and graffiti. Yet, this solid link to Gatineau could also be re-purposed for something more, making it a vital connection to help alleviate the growing commuter traffic that continues to clog area bridges carrying hundreds of cars at Island Park Drive, Chaudiere, Alexandra Bridge and the Macdonald-Cartier Bridge. 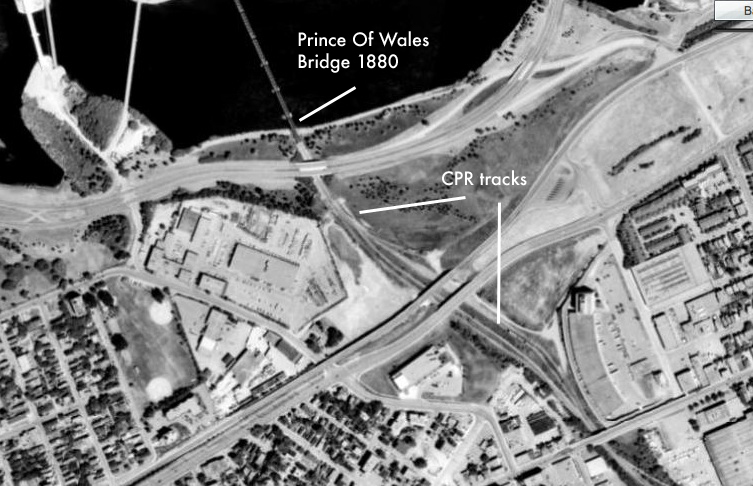 A simple gap of a few hundred metres, bureaucracy and money stands between continuing the O-train across the bridge to the Gatineau side using the old existing rail beds and bridge, a purpose for which the Prince Of Wales Bridge was designed for. It was built in 1880 by the Phoenix Bridge Company for the Québec, Montréal, Ottawa and Occidental Railway to cross the Ottawa River near the busy industrial area of Lebreton Flats and Chaudiere Falls. A few years later the bridge and line was purchased by Canadian Pacific Railway who later modified the bridge in 1926 when they replaced the iron work with heavier iron trusses that could carry heavier rail loads between the two sides. The PoW bridge continued to carry rail traffic until 2001 when the last train chugged across. 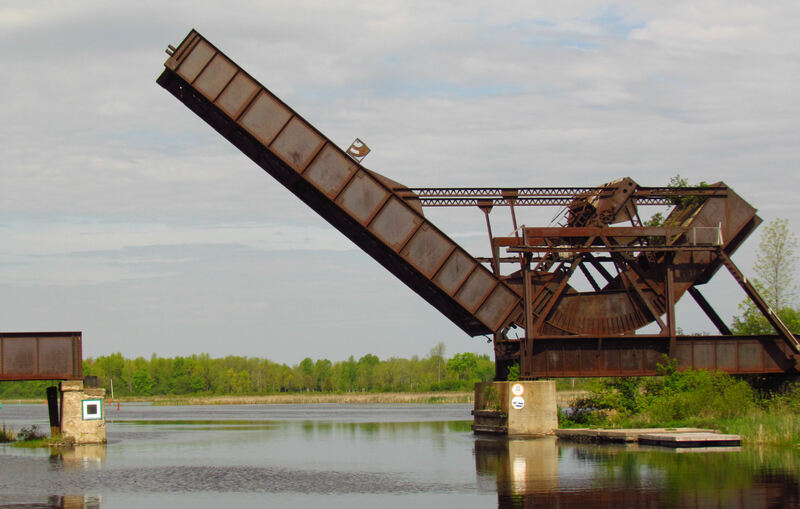 The bridge was soon purchased for its scrap value by the City Of Ottawa, but the purchase included the approach land on BOTH sides of the river, which means the City Of Ottawa owns property on the Gatineau/Quebec side. 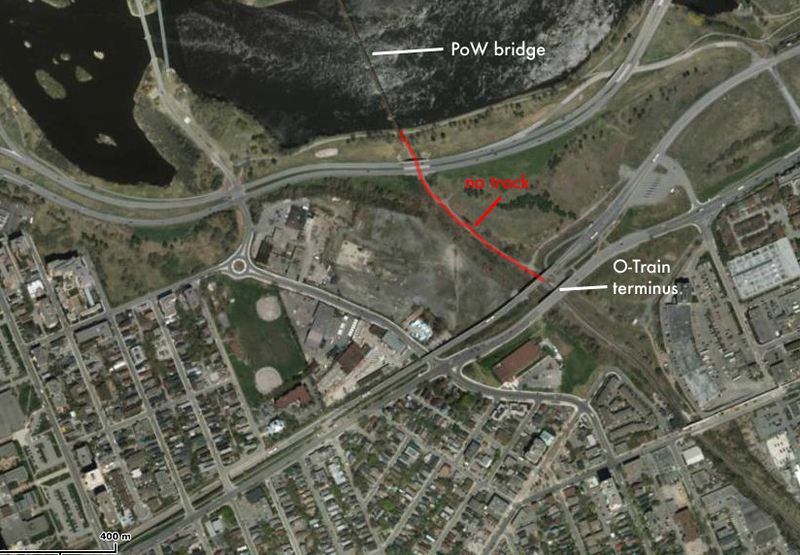 Curiously, the intact tracks that would have led from the newly operating O-train line were disconnected and removed crossing the NCC property during their Lebreton Flats re-vitalization project in 2005. It seems like an odd and unnecessary action to literally derail future extension of the O-train over to Gatineau using the PoW bridge, that with some forward thinking upgrades, could certainly ease commuter traffic if properly implemented. In addition to extending the O-train, of which the original rail beds still exist, future modifications could also see the addition of a pedestrian/cycling path built on the side, much like the one on the Alexandra Bridge further down river. With these modifications to a solid, timeless bridge already in place we could certainly help decrease growing commuter traffic building up on our bridges while increasing healthy alternatives to crossing the river with a safe cycling and pedestrian crossing, which is lacking on other bridges. As I’m sure there are many bureaucratic roadblocks and prohibitive costs involved on both sides of the river that I don’t know about, and there are engineering details that could simply make this a dream, maybe with enough public support for such a vision it could become reality. 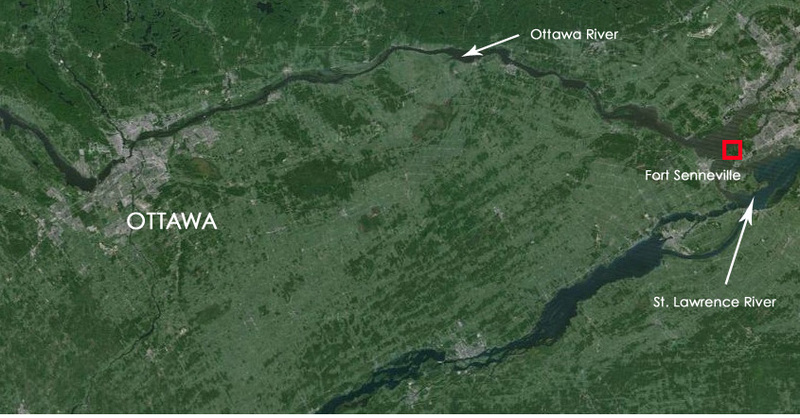 With the City Of Ottawa owning both the bridge AND the land it connects to on both sides of the river, one has to wonder how the NCC and the City of Gatineau would adversely influence a vision that can, and will help all those involved.